On July 19, 2018, Microsoft Corp. announced the financial results for the quarter ended June 30, 2018, as compared to the corresponding period of last fiscal year. But what caught my attention, was the fact the press release included only standard tables with additional downloadable Excel, PowerPoint, and Word documents. 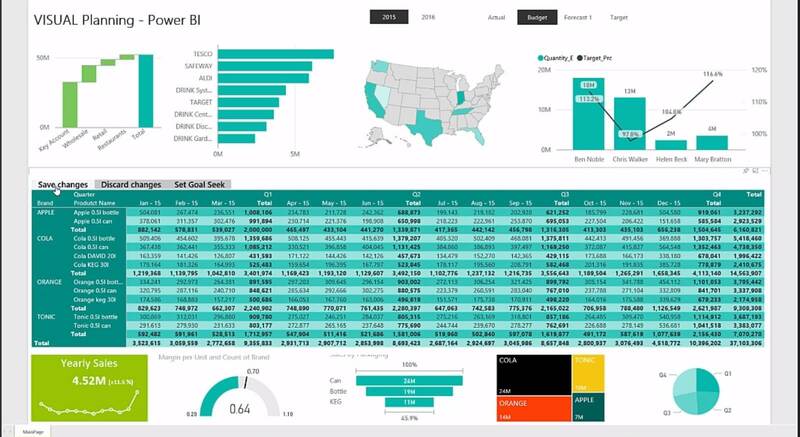 So my immediate thought was, where's the Power BI presentation of these fabulous results??? 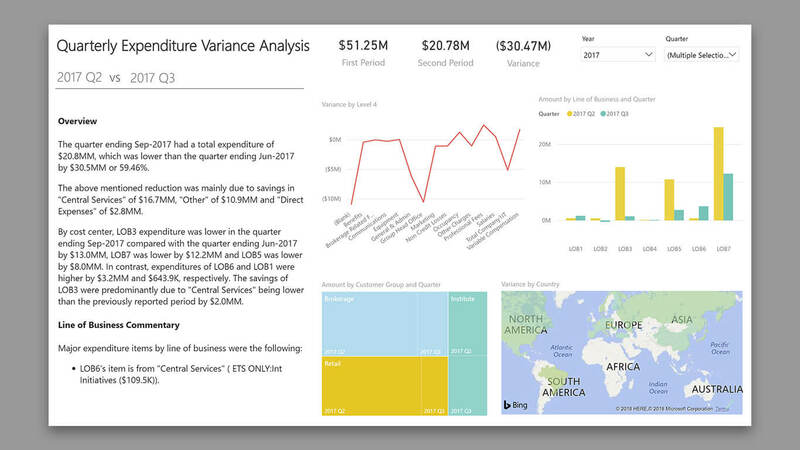 So I tried to redesign the tables in an attempt to present the financial results in a clearest possible way, by leveraging the amazing Power BI capabilities, together with the advanced visualization capabilities of Zebra BI visuals for Power BI. 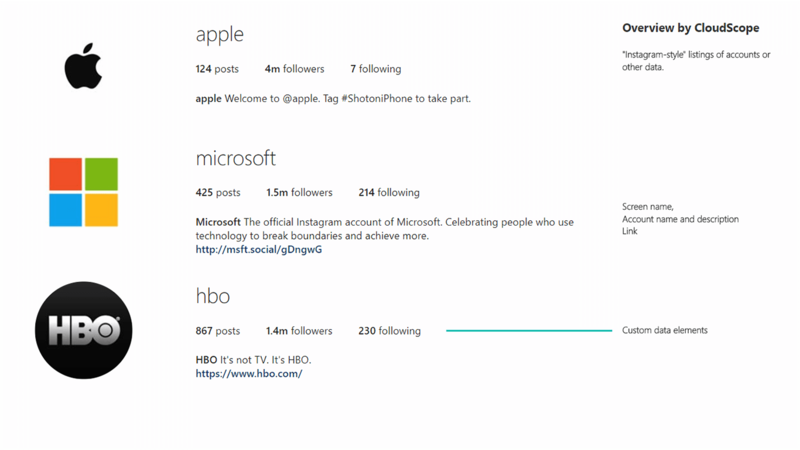 Note: This is not an official presentation of Microsoft Corp. financial results. 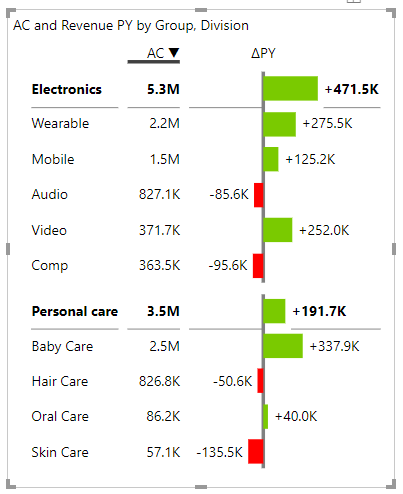 It's just a quick study of how financial data such as income statements can be visualized in a clear and understandable way in Power BI as an alternative to standard data tables. If there is one report that's a business constant, it's the income statement (also known as a profit and loss statement). Its core purpose is to show managers and investors the bottom line of a company for a specific period. It is normally delivered as a structured spreadsheet that shows how the top line (revenues) is transformed into the bottom line after taking out expenses. There is a much better way, however. An income statement tells a very important story about your company and you can tell it in a much more effective way. Instead of relying on just numbers, you can use a visual language that makes your story not just much more attractive but also much easier to understand. First, let's take a look at a relatively simple income statement showing business results for two years. Tip: There are many things you can do to improve the readability of your report. 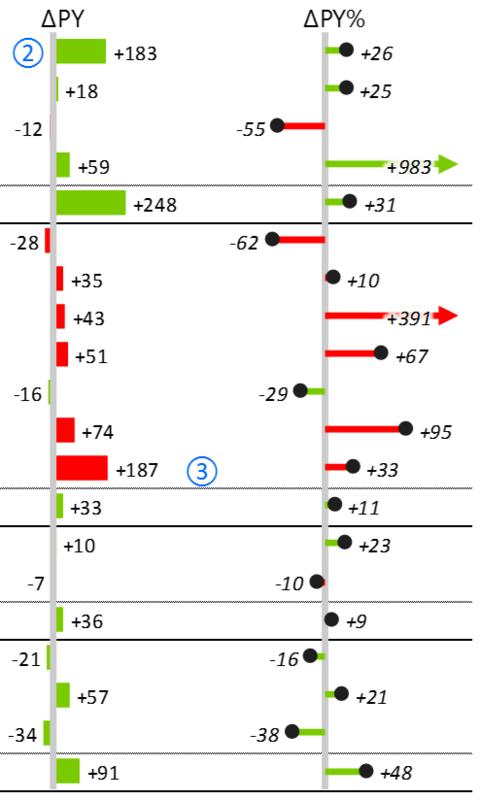 Some are more subtle than others - for example, in the structure waterfall chart, the numbers that have positive contribution are displayed to the right of the bar, while negative contribution values are marked on the left. This is a good practice that clarifies your story without any added visual noise. 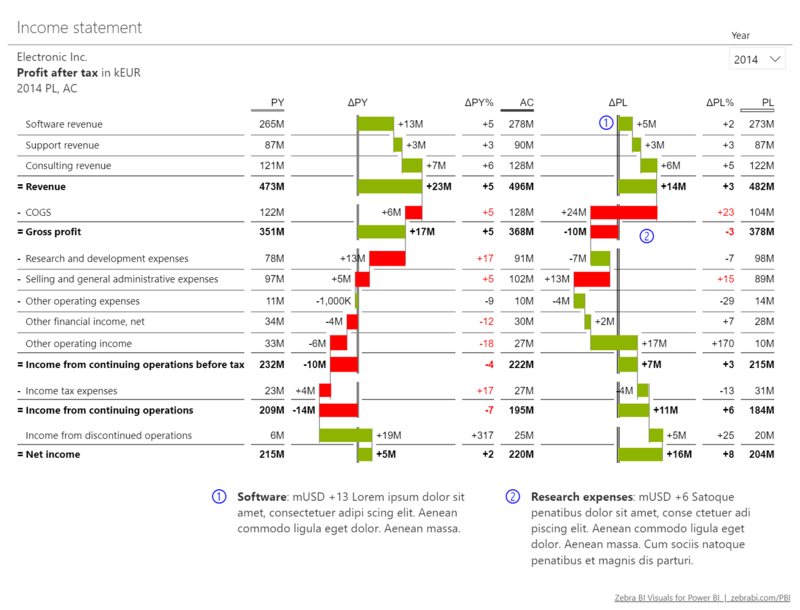 The first and second columns of waterfall charts show the different types of revenue and costs that make up total profit across two different years. The first section of the chart shows revenue sources and growth that contribute to the overall profit, followed by costs, such as purchases, material and other operating expenses that reduce the overall profit. Note the "Operating expenses" which is a subtotal of all other expenses above it. This intermediate calculation improves readability and helps visualize the end result. These subtotals are actually very easy to do in Zebra BI. You only need to tell the software how many rows above a certain cell should be included in the calculation and Zebra BI does the rest. When you create a report like this, you use the "Structure" waterfall chart. This type of waterfall chart shows the structure of the final profit and contributions of individual items. You could also use the "Variance" chart that puts the focus on actual differences. When working with comparisons, you will soon meet the category class column. 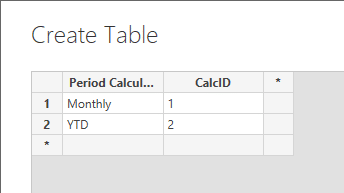 Instead of using negative or positive numbers, you can use the category class column to define whether an item is a positive or negative addition to the total. You can read more about the category class column here. Using this feature you can easily invert KPIs that have a negative contribution despite being a positive value. For example, an increase in the cost of raw materials is a positive value with a negative impact on your overall profit. Zebra BI will show it in red, despite it being a positive value. In real life, you might want to show data for more than just two years. 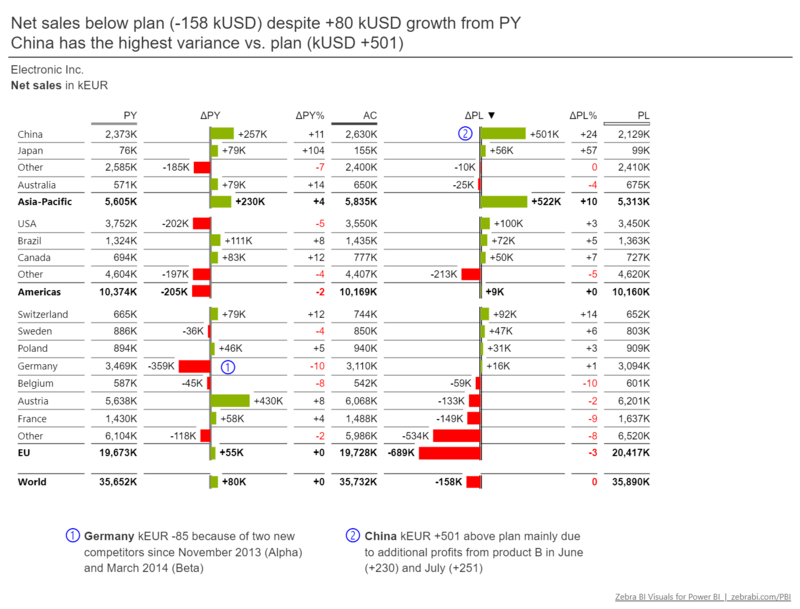 A typical scenario is a report with the current and past year data and plans for the coming year. Notice a different approach to designing the report. With three data sets we are coming up short on space. Since the variance data is much more relevant, we used a table and chart combination. 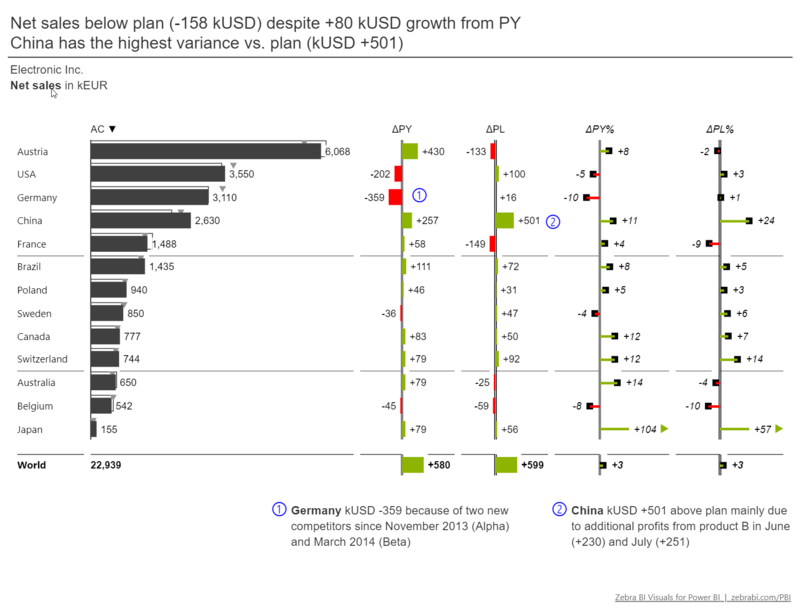 The PY, AC and BU values are displayed in a table, while the more important variance data is visualized with charts. The bar and a lollipop charts are telling the same story as with the previous template. However, we now have two pairs of them - one pair for showing variance from the past year and the second pair displaying the difference compared to the plan. The great thing about Zebra BI is that you have complete design freedom. For example, you could change the order of charts or even place data columns between charts. Tip: When designing a more complex template like this, decide on an order of charts and stick to it. I prefer showing the variance compared to the previous year and then the comparison to the plan. You might want to use a different approach, just make sure to stay consistent. This way, you'll ensure your income statement always tells a clear story at first glance. When designing a report like this, make sure that all the charts that visualize the same type of data are scaled. You can see here that bar lengths clearly display the difference from the previous year and the plan. Keep in mind that this type of reports is fairly useless if it's not scaled. Luckily, scaling is one of the strong points of Zebra BI. 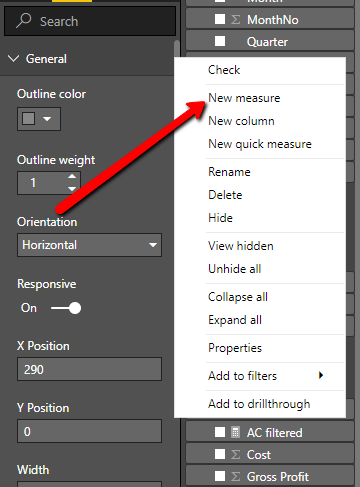 To scale your charts, you just need to select the charts you want to adjust and click on a single "Scale" button. 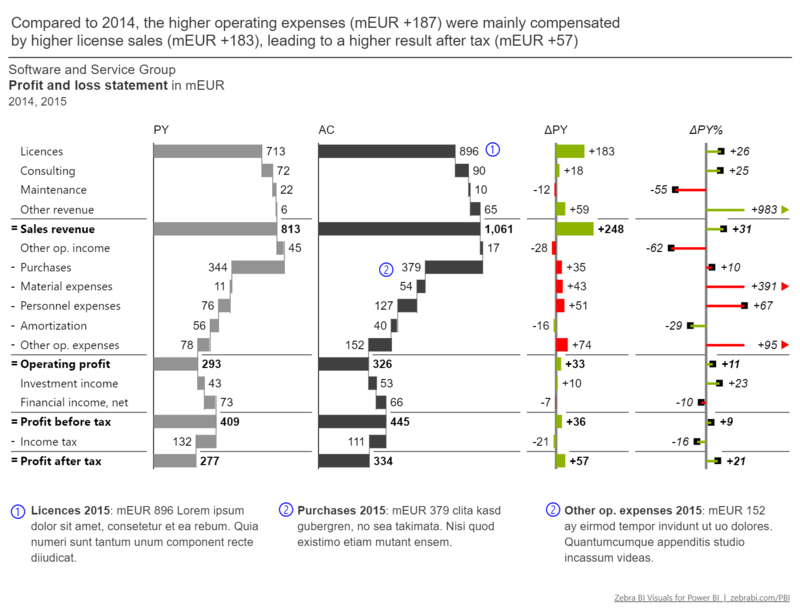 Data here is more aggregated - it's five smaller charts with waterfall charts showing key data: net sales, costs, operating profit, EBITDA and net result. On the right are variance charts showing difference compared to the plan. This is a great way to show the picture of your business on a single page. Again, pay attention to scaling. This report will only work if it is scaled - it must make it clear that Germany is the largest market, followed by France and Great Britain. In this example, the variance bar charts are also scaled to the waterfall charts to show the actual difference. 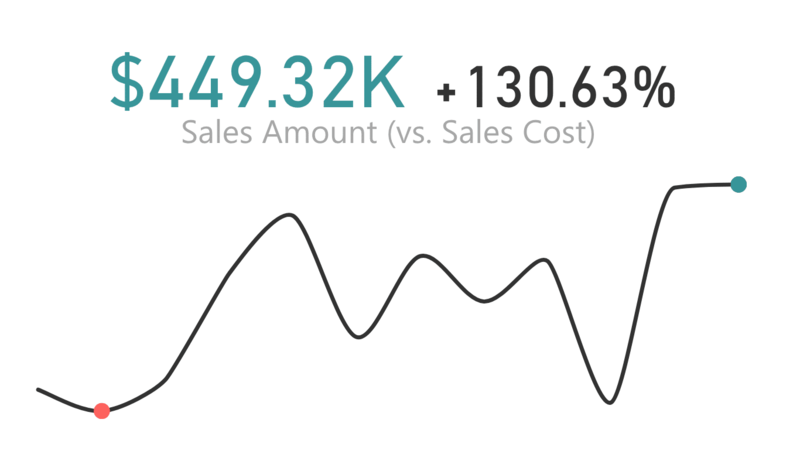 Tip: When designing visual reports like this, pay attention to labeling and headings. Clear and understandable headings help you tell the story while comments help you draw attention to significant data points. This is a very complex page - it contains 10 charts in addition to the headings and labels. However, these visualizations comply with the IBCS standards, which ensures that you can easily read this page without losing sight of the overall picture. Zebra BI has predefined page templates. The page templates fit perfectly into a PowerPoint slide, so you just need to enter your data, create your charts and export everything to create a presentation. Page templates include an area for inputting data and an area for designing your reports. In the first area, you prepare your data that will tell your story. Then simply move your charts into the areas predesigned for them. This is one of the easiest ways to create an income statement for your presentation. You can choose between a number of templates available, including pages that display up to 25 charts. This way, you can choose the page with the data density you require - from a 2x2 grid up to 5x5 grid. Want to create income statements like these? This is a guest post by Saša Butina, a consultant at SASH reporting. See more about SASH reporting at the end of the post. When one monitors financial activities - inflows and outflows from company’s bank account, he/she usually analyses and presents data in table. It’s just something we are used to and basically there is nothing wrong with it. We should have enough time and carefully read through cash flow statements to clearly see what is happening with our most liquid assets. Let’s be honest - at the end, cash is king and cash is what every business is about :). But, as life is getting faster and faster we often miss the time to carefully read all reports, especially if they consist mainly of tables with lots of data. In such cases the reader needs to really focus, understand and have good analytical skills to get to some meaningful conclusions based on reports. That is why all BI (business intelligence) solutions put more and more effort into providing good and simple options to visualize our data. The reason for this lies in fact that most people are visual types and are able to see trends and anomalies faster from charts than from tables. 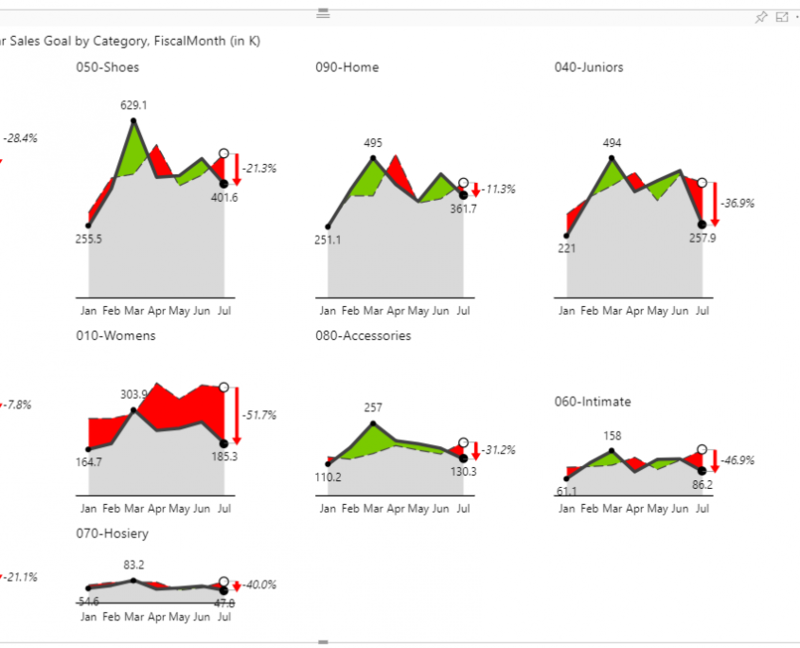 Lots of companies already use different BI solutions with such options and present their business results using different charts. structure charts showing sales structure by products or markets, costs structure by cost type, inventory structures by product and so on. There are lots of other data commonly presented in charts but we rarely see cash flow statement data presented in any type of chart. Even if we do, such charts usually are not very user friendly. You can see few examples of such charts below where it is not clear what the message of each chart is. 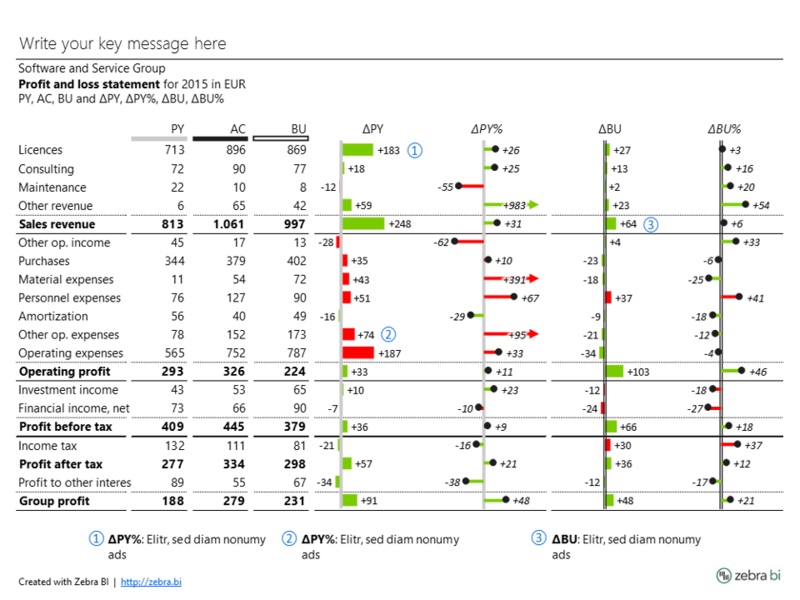 These charts are not easy to read and therefore do not bring added value compared to data presented in tables. we give the reader some recommendation on future actions / decision. In other words – the reader should get the message with one look at the chart and should quickly know what to do next. Let’s take a look at the chart below to illustrate our point. To explain this chart, we should start with grey bars, which present cash position at certain point of time (end of each month in this case). We can see, that at the end of February 2017 cash position was 56k€, at the end of March it was 65k€ and at the end of April it was 47k€. 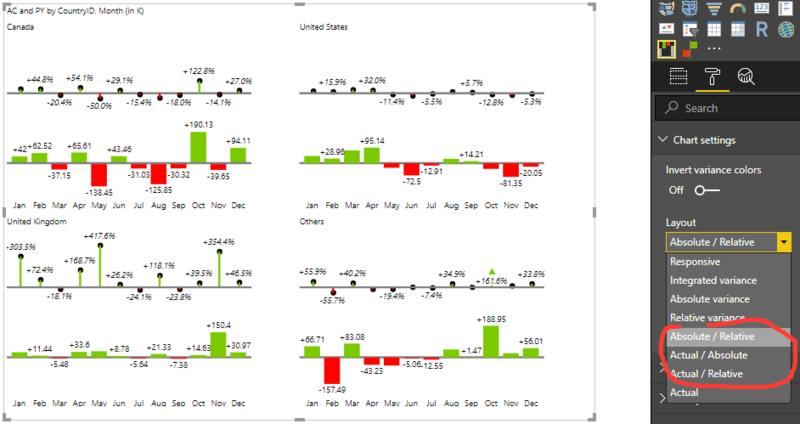 Note: In the chart above the selected period is a month, but we can also show data weekly or even daily. It depends on data we have available and which we want to look at. Further, let’s explain the green and red bars in between. They present net inflow (green) or outflow (red, obviously :)) from different types of business activities. Cash flow from operating activities is one generated by company’s core business operations (receivables collection, wages and payables payments). Cash flow from investing activities is the one generated from buying or selling equipment, assets or financial investments (for example shares in other companies). Cash flow from financing is mainly generated from debt, loans or capital changes. Chart shown above was created at the beginning of May 2017, when the last actual date was end of April 2017. The left part of the chart is presenting past actual data and the right side of chart is reserved for presenting forecasted cash flow for next three months. "Forecast" bars are striped while "actual" bars are colored fully – so you can immediately see what is actual and what forecasted data. On the far right side of the chart you also see red arrow pointing down and two numeric data. These are showing the difference from last actual cash position to last forecasted cash position. The difference is minus 13k€ which means 28%. 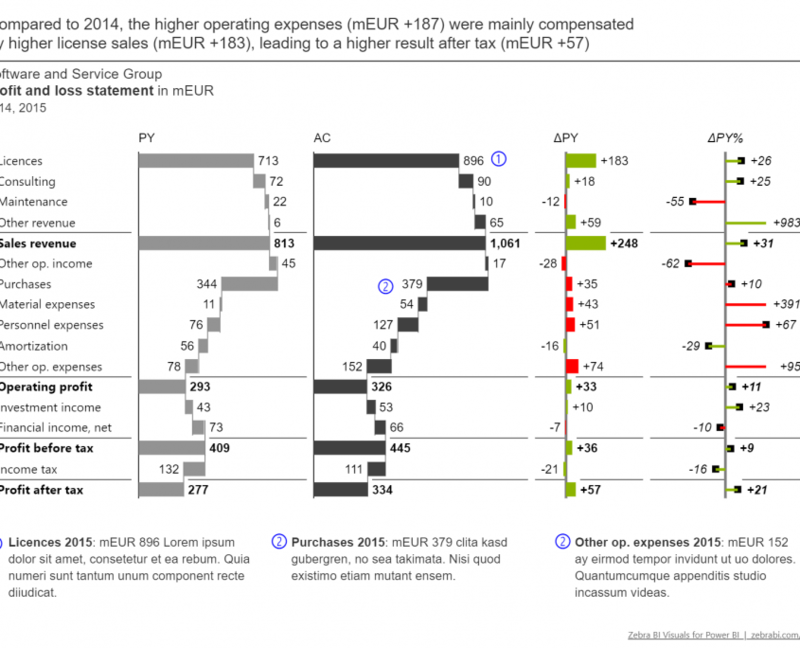 It is quite a lot and cash position in amount 34k€ is not enough for this company to avoid liquidity issues. Therefore, you can also see red caution alert above the grey bar. The general rule for services companies is that cash position in every point of time should not be less than the amount of three months costs. How do we prepare such a chart, technically? How do we prepare cash flow data that is used to prepare such chart? 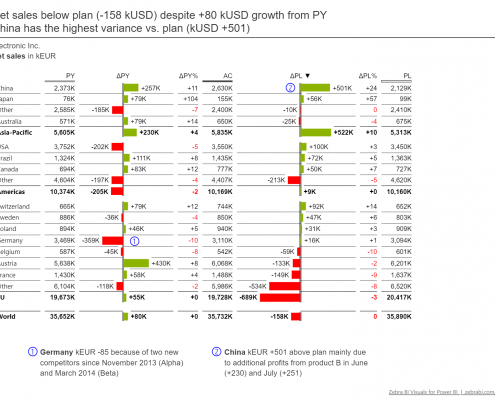 How do we prepare cash flow forecast for next three months? To prepare such chart you need Excel, plenty of Excel skills and plenty of time. 🙂 Even though Excel 2016 introduced waterfall charts, the default Excel waterfall chart is still too limited for advanced cash flow analysis. But there's also a quicker and easier way. Instead of doing it manually, you can try using Zebra BI, a great Excel Add-in that allows you to create advanced business charts in a couple of clicks. The above cash flow statement data is presented in type of analysis called contribution analysis. 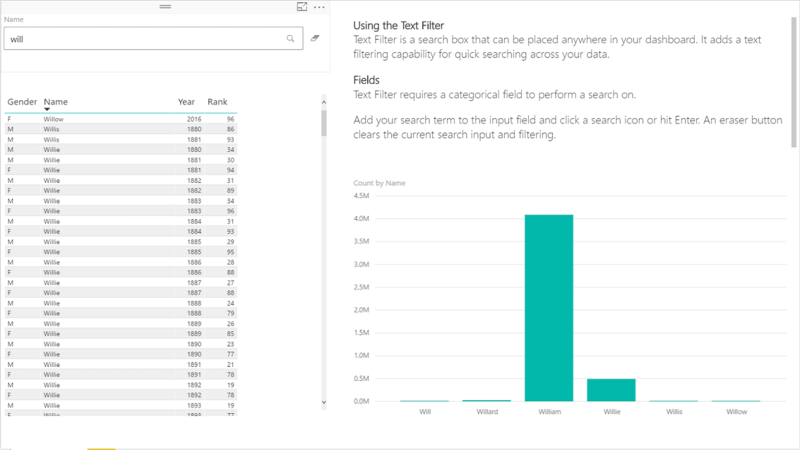 It is the optimal data visualization in cases where the whole (total) values (visualized as "fixed" columns or rows) are explained by partial (subcategory) values (usually visualized as red/green columns or rows). In our case, the whole value is cash position at certain point of time, while the partial values are net income/outcome from different type of business activities (operating, investing, financing). You can start your 30-day free trial of Zebra BI here: https://zebrabi.com/free-trial/. Once you have Zebra BI downloaded, prepare your data as shown on the left, then insert Contribution>Variance Column chart. 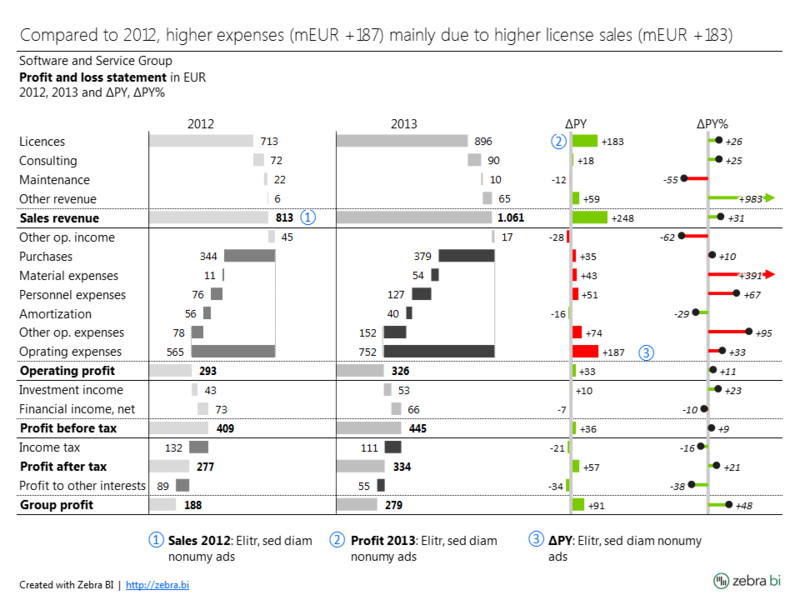 Note: You can learn more about creating waterfall charts with Zebra BI in our Support Center. In general, you have two options / methods to prepare cash flow statement for past periods. Direct and indirect method. Direct method means that you summarize and classify each inflow and outflow from your company’s bank account. It gives you the best information on your cash activities. However, this method is not preferred and used by most companies since it requires much more effort to prepare. This is why most companies prefer indirect method of preparing cash flow statement. It means that you take your Profit and loss statement and your Balance sheet and calculate Cash flow statement out of them. It is more convenient to prepare Cash flow statement using indirect method and besides that, this method gives you another point of view. 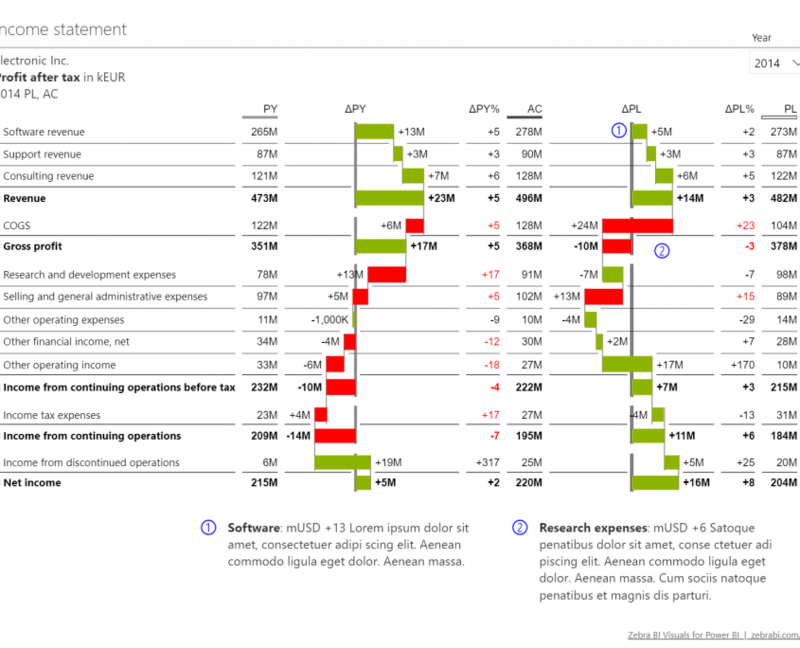 It clearly shows a connection between reported net income (from Profit and loss statement) and cash provided by operations (as the most important category in Cash flow statement). longer term forecast (few months up to half year). To prepare short term forecast you first need to have a list of receivables and payables with due dates and should know if and which of your customers tend to delay with their payments. Furthermore you should also take into account all other potential activities that have bigger impact on cash flow (such as investments, loans taken or repaid…). Based on all this information you can prepare inflow and outflow forecast, but for no longer period than a few weeks. Note: To increase reliability of your business and avoid liquidity issues, you should plan your cash flow for longer than 2-3 weeks. You should know today whether you will need additional financial resources in 4, 5 or 6 months so that you have enough time to arrange them. Preparing longer term cash flow forecast is not a piece of cake :). The information we talked about earlier (receivables and payables with due dates…) does not give you a good basis to prepare the forecast for next 6 months, because when you're dealing with such long periods, there are also other factors that influence your cash flow (for example season influence, growth…). SASH reporting team has developed advanced algorithms to calculate future cash flow based on your past actual data. Different types of cash flow projections are suitable for companies in different stages and in different industries and SASH reporting cash flow projections have all of it in mind. This kind of report gives you better insight and ability to make better decisions regarding your planned cash-flow forecast. We believe that many SMEs lack know-how and resources to prepare and present such cash flow analysis but that doesn’t mean they don’t need it. SMEs need cash flow analysis as much as big companies do. In our opinion even more, because they can run into liquidity problems even faster. For example, SMEs which raised an investment should know their burn rate in order to know if and when they will have to provide additional financial resources. SASH reporting is the option of help for SMEs in need of cash flow or any other type of analysis. 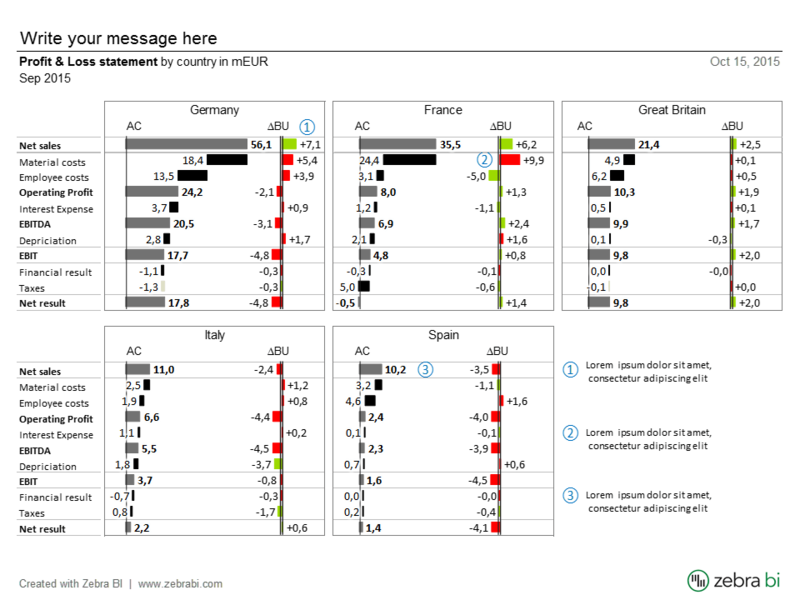 Would you like to see your cash flow in a contribution chart? Visit our web site www.sash-reporting.com or send your e-mail with your needs to [email protected]. SASH reporting enables you to improve your processes, get better insight in your business and above all achieve greater results. 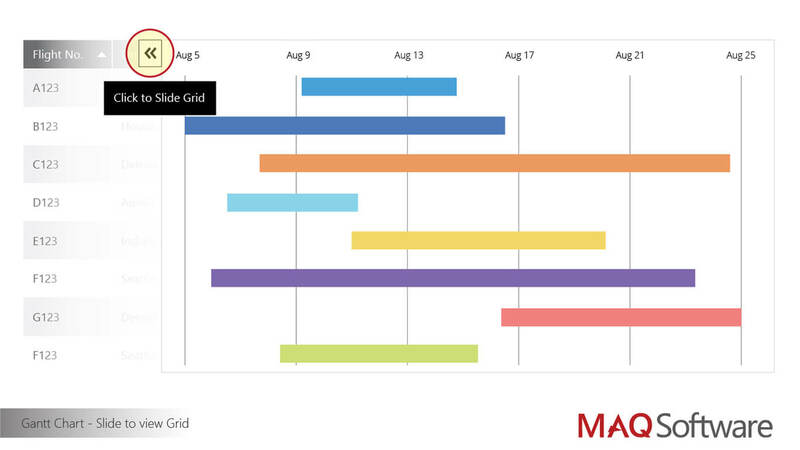 In July 2015 Microsoft announced that the then-upcoming Office 2016 would introduce 6 new charts to their line of charts. The one that was most highly anticipated in the financial community was definitely the built-in Excel waterfall chart. Most companies create plans and budgets to establish benchmarks for future performance in sales, production, operations, labor, etc. The starting point of these plans and budget are usually estimated cost and revenue figures. The goal is to meet these budgets, but as with all goals - they are not always met. Managers use variance analysis to track the actual performance against these goals. If this analysis is not performed afterwards, then setting budgets is useless. Every company uses a variance report to compare the budgeted (also called baseline) amount of expenses and/or revenue with the actual amount. Struggling to visualize your data? Zebra BI’s got you covered! 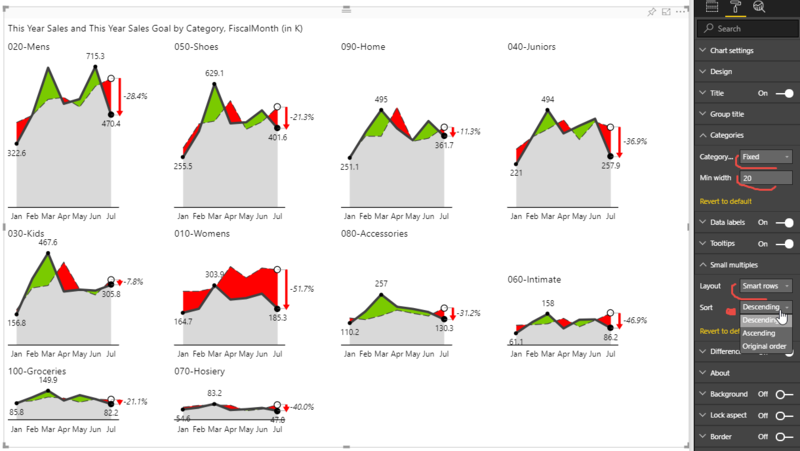 Whether it’s waterfall charts, variance charts, or lollipop charts, Zebra BI has everything you need to visualize your data for all to understand. Picture this: you’re about to present your company’s quarterly earnings to its top executives. You’ve spent countless hours gathering the needed information and placing it into a chart in Excel. You’ve even tried your hardest to make the chart look as appealing as possible. (Unfortunately, you thought this entailed simply adding different colors to different columns.) Upon beginning your presentation, however, you notice that your report looks similar to the one shown below and might be difficult for people not familiar with the information to properly analyze or understand.